Let’s face it, only former detective Adrian Monk can solve the cases he solves. If any random CSI tech could gather evidence at the crime scene or if they could run some perp’s fingerprints through a database or whatever it is they do, they wouldn’t need Monk. Consequently, the mysteries on Monk aren’t always air tight. Actual forensic evidence is usually in short supply. So I’ve often wondered if “the guy” could get a slick Law and Order type of defense lawyer and beat the rap or simply get off on a technicality. That issue is amusingly addressed in “Mr. 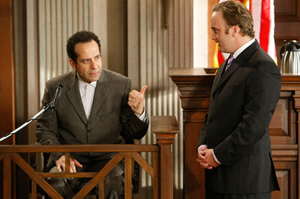 Monk Takes the Stand”, the fifth episode in the eighth and final season of Monk. The slick lawyer in this case is Harrison Powell played by Jay Mohr. He is charmingly and convincingly slimy in the role, but it’s always tough to watch someone be so mean to Monk. Mr. Mohr is well known for a lot of stuff including his current CBS series Gary Unmarried, which returns for a second season on September 23rd. However, I know him best from the short-lived 1999 Fox series Action, co-starring Jarrad Paul who played Monk’s now sadly deceased neighbor Kevin Dorfman. Remember the adorable little tyke Jonathan Lipnicki in the 1996 film Jerry McGuire (which coincidentally co-starred Jay Mohr)? Well, he got big. He plays Rudy Smith, Lieutenant Disher’s “little buddy” in this episode. Now he’s a “dope smoking, chain snatching, little thug” He does a pretty good job too. Every Monk fan waits with bated breath for the conclusion of each new episode and the here’s-what-happened. In this topsy-turvy episode that’s where it starts. Monk is just getting to the really good part with the black and white flashback of the crime committed by sculptor Evan Gildea (Joseph D. Reitman), when super defense attorney Harrison Powell arrives in his slick convertible and his pin striped suit to drag his client away before he can say anything too incriminating. Monk corrects him. “One hundred and twelve.” Coincidentally, or probably not so coincidentally, this is the 113th episode of Monk. So that works out just about right. Harrison Powell shows up with his client and his cocky attitude. He’s not interested in the plea deal that the D.A. still wants to offer. He wants them to drop the case. “You can keep the police from looking like chimpanzees with guns,” he tells the Friedkin. Stottlemeyer, Disher and Monk all know what that looks like. So do Monk fans, because we saw it in “Mr. Monk and the Panic Room”. (I wonder if Harrison Powell somehow knew about that little incident.) In the courtroom Stottlemeyer gives his testimony first. Nancy Gildea was killed on October 2nd. “The housekeeper had discovered the body,” he testifies. Of course she did. If you’re a maid on Monk you’re either finding a corpse or being one. “You a lawyer now? A little Doogie Howser thing going on? That does the trick. Randy recognizes a young man across from them. It’s Rudy Smith a boy he used to mentor in the “Big Buddy” program. He goes over to chat with Rudy, but they’re interrupted by a plains clothes detective (Garrett Davis) who moves Rudy jacket and reveals that Disher’s little buddy is handcuffed. He tells Disher that Rudy “robbed a store and killed a clerk.” He takes the boy away. Inside the courtroom Stottlemeyer’s testimony continues and he describes how Monk discovered the first clue. Gildea used someone else’s sculpture to whack his wife with rather than his own which was closer to where the fight started. Harrison Powell easily undermines his testimony. Getting Captain Stottlemeyer to admit they don’t know for sure where the fight started or if Gildea would in fact avoid using his own sculpture as a murder weapon. Stottlemeyer says it was just a theory which led them to more evidence. Powell promises to get to that “evidence” (accompanied by his air quotes) later. He repeats “Captain Stottlemeyer” in a mockingly respectful way each time he asks him a question and Stottlemeyer starts to get rattled. Remembering the incident he makes the same noise in the courtroom. When he denies it, the judge has the court stenographer (Marcia Moran) read it back, in possibly the funniest one line performance ever. Even in the court room Monk avoids looking at the statue, but Powell is insistent. It’s his clients alibi. Rudy says he did rob the store, stealing thirty dollars and a gold chain from clerk’s neck (a detail not in the police report), but he didn’t kill her. The clerk was alive when he left. When he swears to this while wearing the old friendship bracelet Randy has brought, Randy believes him. Powell tells Monk that the art experts say it would take at least twelve hours to sculpt a statue like that. Gildea claims that the marble the statue was carved from had been delivered the day before at 5:00pm and he has a receipt to prove it. He seems to have the perfect alibi, but Monk suggests he could have carved the statue at any time and hidden the marble delivered that day. Gildea points out that it’s hard to hide two tons of marble. An investigation of Gildea’s dusty kitchen reveals a melted Popsicle, a slow clock, and a dust free extension cord. Monk figures it out. Gildea used a jackhammer to turn the marble into gravel and spread it across his driveway. Monk thinks he blew a fuse while using the jackhammer. Which is why the Popsicle melted and why the clock was slow. Powell ridicules the theory, asking Monk if he’s a science fiction writer. He brings in a “sample” of the gravel stating that if Monk is correct all the pieces should fit back together “Like a giant jigsaw puzzle.” (Of course, that’s absolutely ludicrous. First of all, it’s only a sample so the pieces that fit with pieces in the wheel barrow may well still be in Gildea’s driveway. Some of the marble would have been reduced to dust and the pieces would never fit together.) It’s nothing, but a theatrical stunt which the D.A. should object to, but instead Natalie does. When the judge wants to know who she is, Powell claims she’s Monk nurse. On the front steps of the courthouse Evan Gildea tells reporters how much he loves the justice system. As Natalie wonders what they can do now. “Nothing,” Harrison Powell says as he stops by to gloat. Stottlemeyer explains that double jeopardy has attached “How do you sleep at night?” Natalie asks Powell. Apparently the win is pretty good publicity for Powell. Next thing you know he‘s schmoozing with a talk show host (Shaun Robinson) and promoting his book, modestly entitled Undefeated. The following day Monk is in a session with his psychiatrist Dr. Bell. He announces that he’s quitting. He’s worried that all any criminal has to do is hire Powell to get off scot-free. The Doctor tells him a long story… no, a parable… no, an allegory… a baseball allegory. In college Dr. Bell played baseball and there was pitcher who always struck him out, but he didn’t give up. He studied his opponent carefully. Eventually he learned his curve ball “tell” and hit a home run. Monk is not inspired. “I don’t want to be rude. Is that the end of the allegory?” He’s still quitting. Randy reads the file aloud and mentions that the victim was killed by a blow to the medulla oblongata, exactly the same way as Nancy Gildea. “When did it happen,” Monk asks. “About 10:00pm?” He’s right. Monk has it figured out and when they retrieve a burnt out tail light from the front of the store, they have enough evidence to pull in Evan Gildea for questioning once again. Monk explains that immediately after Gildea killed his wife, he discovered he had a burnt out tail light. Not wanting to be stopped by the police for it on his long drive back to Santa Barbara, he went to the nearest auto parts store to replace it. Unfortunately for him, he was there at the same time as Disher’s little buddy Rudy who was robbing the store. Once Rudy was gone the clerk told Gildea that there was a camera and the whole thing was on video. Knowing that the police would see him on that tape and know that he had killed Nancy, he grabbed a tire iron, killed the clerk and took the tape. Monk explains that since that information about Rudy wasn’t in the police report or in the papers the only way Gildea could have known about it was if he had been there. They’ve got him. Powell, still trying to intimidate Monk, says he’s looking forward to going up against him in court again. “No, you’re not,” Monk tells him confidently. After Powell’s gone he’s not so confident. “He’s going to rip me apart” Monk says. The rest of the gang reassure him and helpfully advise him on his courtroom conduct. Gildea is convicted. Powell is humiliated. The dope smoking, chain snatching, little thug gets community service and Monk is vindicated. “I’m proud of you,” Natalie tells him. “You were the best witness ever.” She offers him a ride home. They walk out together, but after a moment he comes back alone to straighten the microphone at the witness stand. As he does so a beautiful, slow piano variation or the original theme song plays in the background. After eight years, you’d think there weren’t many Monk stories left to tell, but they really shook things up with this one and yet still delivered a nice little mystery and some good character development for both Monk and Disher.